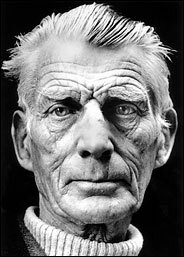 Samuel Beckett - Rigor of another time? You Must Go On After Beckett. I Can't Go On After Beckett. Go On. SOME years back, the playwright Tony Kushner amused a conference audience by talking about two different types of theatrical enterprises: "lasagna" dramaturgy and "matzo" dramaturgy. Samuel Beckett in the 1980's. Describing how Beckett works like "Waiting for Godot" and "Endgame" changed theater, the playwright Tina Howe said, "We were suddenly given permission to work from the inside out." His own plays, like "Angels in America," clearly fell into the lasagna category, he said, providing a grandiose, chewy and multilayered immersion in particular social realities. Matzo drama, by contrast, was thin and spare; it required what Mr. Kushner called a "spiritual discipline" that he didn't feel equal to, and to him the quintessential "matzo of a playwright" was Samuel Beckett. That matzo would have been 100 years old next month, and predictably, there is an avalanche of productions, readings, publications, academic conferences and more around the world to celebrate the Nobel Prize winner's work. Yet Beckett, who died in 1989, has always had a somewhat uneasy relationship with the United States. After all, his embrace of boredom and emptiness is often at odds with America's love of bloat, thrill and fast-paced mannerism. Serious graduate students in playwriting invariably cite him as a major influence, and some of these folks (Christopher Durang, Richard Greenberg) have now achieved prominence in the field. Their work has mostly taken very different, more worldly paths from Beckett's, though. Mr. Kushner is one of the playwrights who find Beckett's greatness to be dual-edged. He treasures him but said he worried that Beckett's influence could prove so powerful that it could threaten to paralyze a dramatist's writing. "Beckett is like Shakespeare," he explained. "He's very dangerous, because his voice is so overwhelmingly persuasive and influential. I never read him when I'm actually writing something. Because you can't. It's a voice that changes your own voice. It just completely overwhelms you. Or me, at any rate." He added: "There are playwrights whose whole careers are based on doing half-baked imitations of Beckett's telegraphic, gnomic style. It's the gnomic side of it that's worrisome, because part of the game in Beckett is the way the writing is pitched on the line between profundity and meaninglessness." John Guare, whose work early on was compared to Beckett's almost as frequently (and superficially) as Edward Albee's was, made a similar point: "Beckett's a great writer but a bad influence and almost sui generis. I hate the way people - playwrights, directors, designers - will create a Beckett-like atmosphere and think that gives their work relevance and depth. Beckett earned his despair. We can't spray on that despair." Mr. Guare, who teaches playwriting at Yale, added: "Young writers used to think tramps speaking non sequiturs passed for playwriting. As a teacher, you want to stop people from writing pastiches of Beckett." As Mac Wellman, the director of Brooklyn College's graduate playwriting program, said, Beckett's plays have a strain of cruelty in them, and without it, his work becomes "saccharine and faintly sentimental." "It's leprechaun theater - charming little leprechaun clowns in bowler hats," he said. "There's a lot of that sort of theater around." A number of the 17 playwrights surveyed over the past few months for this article teach at prestigious institutions. They have experienced widely different degrees of interest from their students about Beckett, however. Neither Mr. Durang, co-director of the playwrights program at the Juilliard School, nor Richard Nelson, chairman of the playwriting department at the Yale School of Drama, could remember Beckett's name arising in discussions of student work. In contrast, Paula Vogel, director of the M.F.A. playwriting program at Brown University, said he played an essential part in her teaching. Mr. Wellman warned of taking such accolades too seriously: "A lot of people claim to like Beckett and don't really." He pointed out that Beckett's stripped-down art was conceived during a time of postwar desolation that "is really inconceivable for us now." Richard Maxwell, a young playwright whose work has been compared to Beckett's, echoed that sentiment. The author of "House," "The End of Reality" and other plays deliberately saturated with banality and lethargy, Mr. Maxwell said, "Beckett's work is a little too cerebral and bleak for me to completely embrace." He continued, "I have a kind of appreciation for what I imagine to be rigor, and that rigor seems to belong to another time." The shortest theory on Beckett's influence came by fax from David Mamet: "He was a great kisser." The most elaborate and upbeat theory came from Ms. Vogel, who declared that "Beckett enabled women to become playwrights." "I wonder what would've happened had Beckett existed as a colleague, or a contemporary, or even as a forerunner to Virginia Woolf," Ms. Vogel said. "What would've happened if she had seen the ability to dramatize stasis, where drama was no longer about the conflict of men in action, but was instead a conflict of perspectives? I think Virginia Woolf would've become a playwright." "The huge gift that Beckett gave to theater, to women playwrights in particular, is our notion of dramaturgy: a non-Aristotelian, nonapocalyptic sense of time, sheer chronicity that stretches to eternity," she continued. "In the 1960's, women experimental writers were criticized for being static, but they actually would have stayed away from drama without Beckett's model, because quite frankly it wasn't a form that appealed to their different notion of dramatic time." Another prominent playwright, Tina Howe, agreed. "Because of Beckett, playwrights could stop thinking about the intricate hoops their characters had to jump through to ponder the more compelling question - why do they have to jump at all?" she said. "We were suddenly given permission to work from the inside out. This was especially thrilling for us lady dramatists, because it meant we could toss out all those constricting male hoops and design our own obstacle courses. And what courses they've been - mutable, obsessive and sublime." Yet reverence for Beckett can sometimes border on the oppressive, said Theresa Rebeck, whose numerous plays include several that scrutinize female behavior codes ("Spike Heels," "Bad Dates"). "The fact is there is an element of the theatrical community which looks down on a more story-centric and 'traditional' kind of playwriting," she said. "Beckett is sometimes used as a club by these people, who sneer at those of us who are moved by a well-told story." The avant-gardist Richard Foreman, whose own style steers clear of conventional "well-told stories," used the same epithet: "I respect Beckett, and obviously he was of great importance, but I resent the fact that people tend to use him as a club to beat down other avant-garde efforts." It is also true that Beckett's rigor and discipline can make other theater look trivial and loquacious. Will Eno, another young playwright whose work has occasionally been compared to Beckett's, said, "I think his significance grows, our need for him grows, in correlation to the piles of junk and nonessentials our culture seems bent on producing." To Mr. Eno, the author of the fractured and self-consciously self-denigrating monologue "Thom Pain (Based on Nothing)," Beckett will be important "as long as people still die." Indeed, part of what makes Beckett's plays vital is the way they boil down essential experiences - birth, death, even the act of watching the play - into such condensed and exquisite packages. That is why Mr. Greenberg, currently one of America's most prolific and frequently produced dramatists, finds Beckett's work necessary. "Beckett's plays are on some profound level about the excruciation of time," he said. Theater, after all, can hold the audience hostage for hours; Beckett makes that playgoing experience a part of his plays. "If a lesson can be extracted from this that's of use to a student playwright, it's this," Mr. Greenberg said: "The playwright's primary act is the taking of time; for this not to be pure theft, time has to be acknowledged, somehow, as the inevitable subject of every play - as the thing that's happening in the room." No one concentrates the mind better than Beckett on the splendidly dubious pleasures of being there.